When is a Ferrari not a Ferrari? When it’s got an engine from Maranello but is badged as something else. We feature four cars with Prancing Horse power: the Alfa Giulia Quadrifoglio, Lancia Thema 8.32, Maserati GranTurismo and Fiat Dino. If you want the genuine article, how about Mr Pininfarina’s personal one-off Ferrari 275 GTB? There’s more Maserati merriment with a full collectors’ guide on the four-door QPIII. 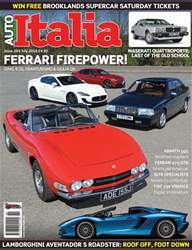 On a smaller scale, we fall in love with a dinky Vignale-bodied Fiat coupe and drive a wide-body, tuned Abarth 595. 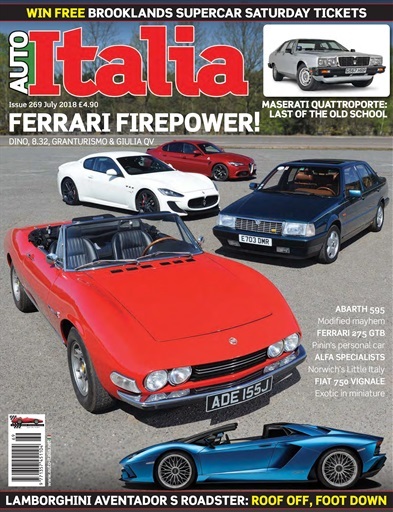 Add in shows aplenty – including achingly spangly images from the 1971 Turin Motor Show – and you very much have ‘The Full Italian’ to digest! LAMBORGHINI AVENTADOR S ROADSTER – How does Lambo’s new ‘S’ feel with the roof off?